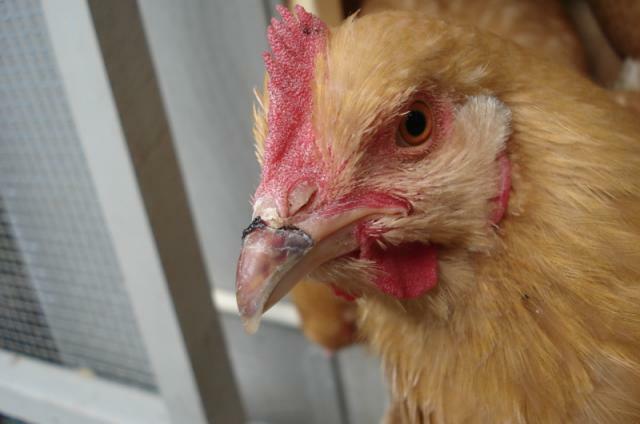 The most common ways chickens damage their beaks are from fights with other flock members, getting them caught in hardware wire or other small spaces, or from predator attacks. Beak injuries can range from mild indentations in the beak wall to partial loss of the beak. Beak injuries can have initial as well as potential long-term consequences. Initial complications include reduced feed intake, reduced activity and pain. Potential long term consequences include secondary deformations to beak, especially if the injury isn't treated promptly and correctly. Chickens have a conical-shaped, moderately curved beak. Normally, the tip of maxilla (top portion of the beak) slightly overlapping the mandible (bottom part of the beak). The beak is composed of several different structures and layers. Keratin surrounds the outer portion of the beak, which protects inner soft tissues, dermis, and bone. The keratin that coats the lower beak is referred to as gnathotheca and the upper beak keratin layer is termed rhinotheca. Kertin is a hard skin surface that is produced by the dermis of the beak. Treatment of beak injuries varies depending on the severity and extent of the damage. Minor beak injuries may not require any treatment at all, other than modification of the bird's environment to help prevent further damage to the beak. This may require separating certain chickens from each other, or covering hardware wire or other small holes with soft mesh, or other soft material. 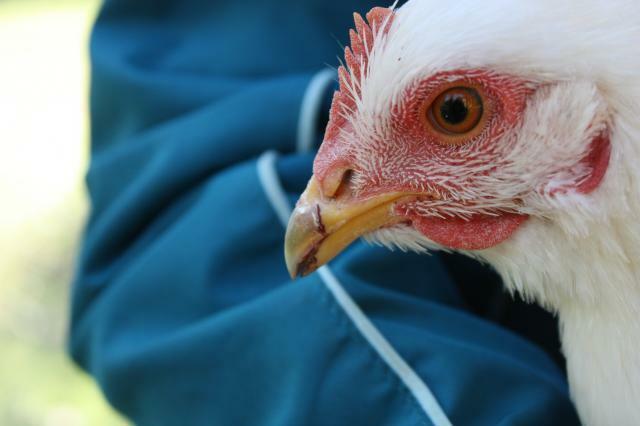 For more extensive beak injuries, the chicken should be brought in to see your veterinarian for wound care and reconstruction of the beak. Methods for beak reconstruction range from filling with dental acrylic with or without small pins to stabilize the beak tip, to use of 3D printing. Environmental modification Modify the environment to prevent further damage. Beak reconstruction Performed by an experienced avian veterinarian. Depending on the extent of the damage, the chicken may require a 3D printed prosthetic beak, which has had multiple incidents of successful outcomes recently. Using metal hardware wire that is too large so that birds can fit their beak through the cage wiring. This can be hazardous to birds and increase risk of injury to the beak, which can occur if birds get nervous or spooked and suddenly jerk their beak out of the wire backwards.